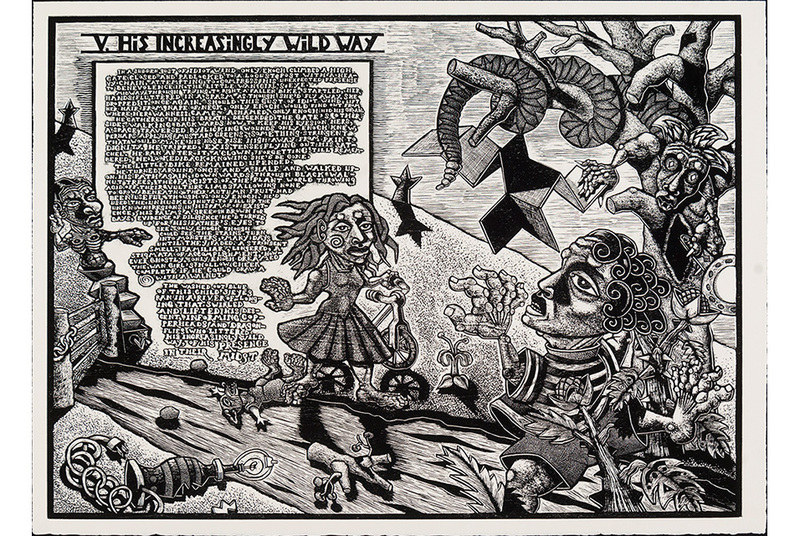 Jay Bolotin (American, born 1949), V. His Increasingly Wild Way, from the portfolio The Book of Only Enoch, 2015, woodcut and relief etching on Arches cover paper, 21 3/4 x 30 inches, Joel and Lila Harnett Print Study Center, University of Richmond Museums, Museum purchase, funds from the Louis S. Booth Arts Fund, H2015.06.06 © Jay Bolotin, photograph by Tony Walsh. RICHMOND, VA.- Jay Bolotin: The Book of Only Enoch is on view in the Harnett Museum of Art, October 14, 2015, through January 24, 2016. The art of Jay Bolotin (American, born 1949) crosses many disciplines, including visual art, theatre, film, literature, and music, but his true métier is storytelling. The University Museums presented a one-person exhibition Jay Bolotin: The Jackleg Testament Continues two years ago in the Harnett Museum of Art. One gallery of the exhibition was devoted to a work in progress, a preview of The Book of Only Enoch. Included were working proofs from the portfolio, process drawings for the animation, Kharmen, his prologue operatic animation, and the artist drew directly on the walls of the gallery, covering the walls by drawing images and writing lengthy passages of text. The installation was a preamble, and now the series of twenty prints is finished and this exhibition presents the complete portfolio The Book of Only Enoch. This is the latest episode in the artist’s ongoing Jackleg Testament, a multi-volume saga that is as all-encompassing for the viewer and reader as for the artist. In his new portfolio, Bolotin draws us into Only Enoch’s universe through text and imagery that engulfs our senses and imagination. Raised on a farm in rural Kentucky, Bolotin’s childhood was filled with storytelling and music, both of which influenced his artwork. He studied art at the Rhode Island School of Design and served as an apprentice to sculptor Robert Lamb. In the early 1970s, he pursued his interest in music, working as a songwriter with Kris Kristofferson, Merle Haggard, and Dan Fogleberg. The personal and narrative quality in Bolotin’s work as a musician is paralleled in his visual art. The viewer encounters characters embroiled in psychologically intricate dramas, and these characters appear – and reappear – in multiple pieces, created in a variety of media. This interdisciplinary approach to his art has provided the foundation for Bolotin’s multilayered, performance-based works that include plays, operas, films, and a music-theater-dance collaboration. Organized by the University of Richmond Museums, the exhibition was curated by Richard Waller, Executive Director, University Museums, in collaboration with the artist. CINCINNATI, OH.- For the fall season, Carl Solway Gallery presents three solo exhibitions of artwork incorporating light, motion, video projection and various forms of technology. Erwin Redl’s exhibition, featuring work from 2010-2015, includes an installation composed of digitally controlled LED light sculptures, kinetic sculpture, drawings and prints. Pascal Dufaux builds kinetic sculptures incorporating video cameras, ceramic, metal and glass that he refers to as Alien Forms. 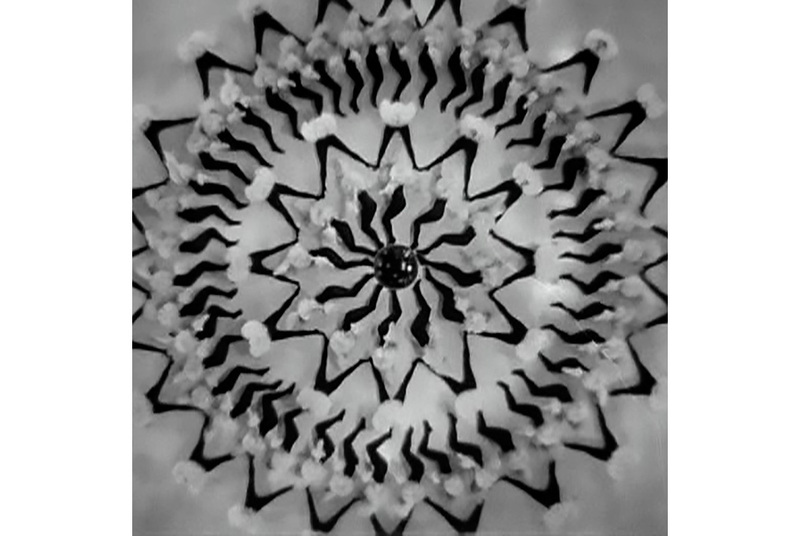 Rachel Rampleman’s exhibition consists of two experimental projected videos: Busby Berkeley 2.0, from 2014 and Water/Light Study, from 2015 and another looped video on a traditional monitor. 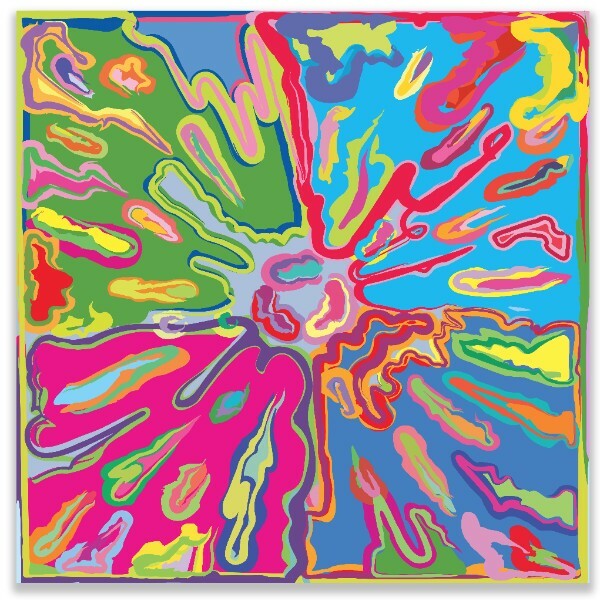 His exhibition at Carl Solway Gallery includes work in various media from the last five years. The light installation, Benchmark, composed of grids of LEDs, continuously changes density and color. 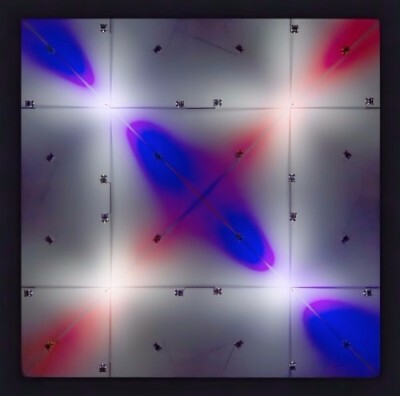 Three new light sculptures titled Dial white-red, white-blue, a new edition published by Carl Solway Gallery, are being shown for the first time. The kinetic sculpture, Ascension (line 24), features glass tubes, LEDs and ping pong balls, creating a humorous sound and light event. Redl also produces two-dimensional work and the exhibition includes a suite of drawings and several prints from the series CNC Palimpsest. 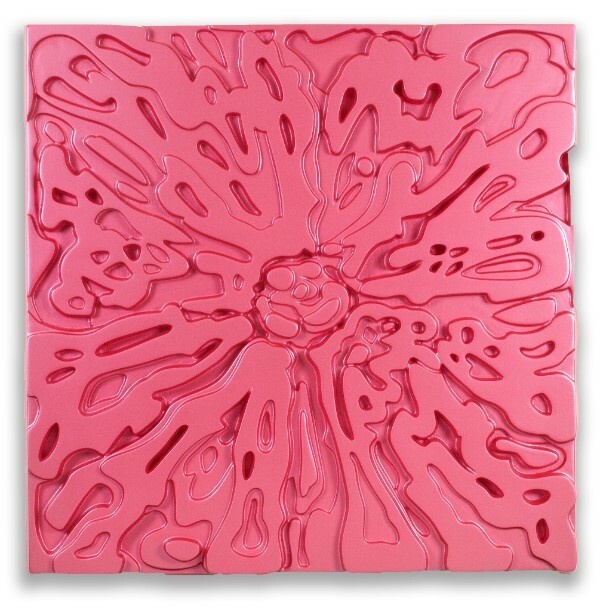 These prints are made by inking the horizontal bed of the CNC Router machine that the artist uses to fabricate much of his sculpture. Redl treats this machine bed much like a printmaker treats a lithographic stone or etching plate. The resulting prints trace the schematic evidence left behind by the machine’s milling path. 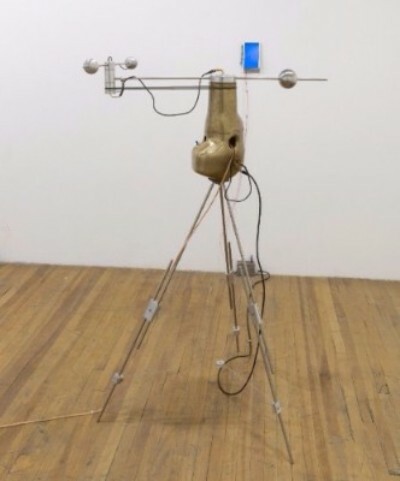 Cincinnati viewers were introduced to Redl’s work In the Spring of 2015, when he developed the installation Cincinnati Swing for the Contemporary Arts Center. Composed of hundreds of swinging LED lamps, the installation covers the entire “urban carpet” of the Zaha Hadid building, from the lobby up to the sixth floor. 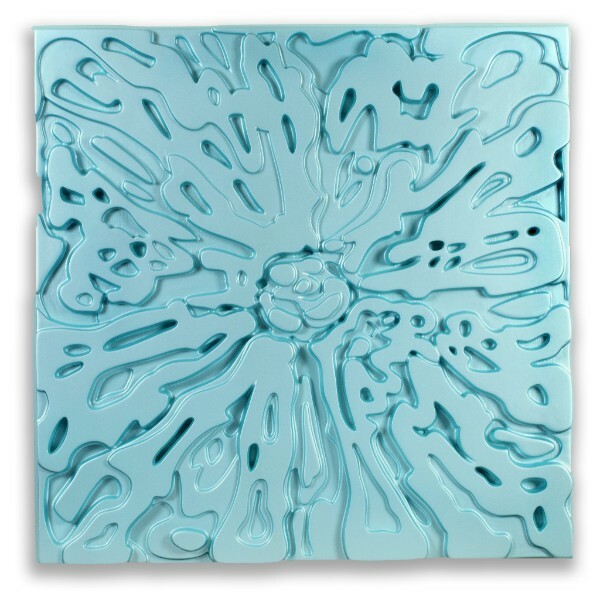 His work is internationally exhibited and permanently installed in locations in San Francisco, New York City, West Hollywood, Seattle, St. Louis, Toronto and Istanbul, among others. His installation Matrix VI lit the face of the Whitney Museum of American Art during the Whitney Biennial 2002. Public collections include the Museum of Contemporary Art, San Diego; Milwaukee Art Museum; and Whitney Museum of American Art, New York. Pascal Dufaux builds what he refers to as “Vision Machines”, rotating kinetic sculptures incorporating video cameras and projections. Their roving “eyes” record the world around them in real time and then project the imagery onto the surrounding walls. The exhibition includes Vision Machine #5: Probe, three pieces from the series Vanities and a group of small works titled Alien Forms. Vanities consist of video surveillance cameras enclosed in biomorphic sculptural forms. Glass and crystal chandelier parts hang in front of each camera lens. The point of view of the camera is then displayed on a mini flat screen. Mixed-media, small-scale sculptures comprise the series Alien Forms. They are displayed on a shelving unit, forming a cabinet of curiosities. Rachel Rampelman primarily works with time-based media and her videos explore subjects as varied as gender, artifice and spectacle. She frequently showcases strong female personalities, such as bodybuilders and women in hair metal tribute bands, who challenge common notions of femininity. 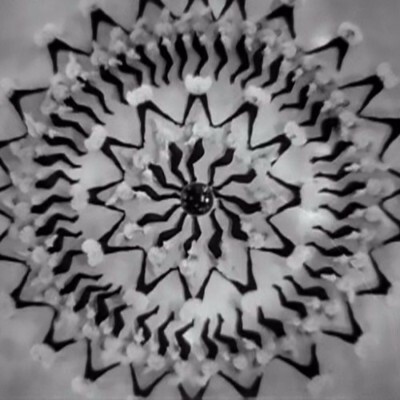 From a series of videos titled Burlesques/Showgirl Studies, Busby Berkeley 2.0 transforms and abstracts the bird’s-eye views from an example of Busby Berkeley’s cinematic choreography. Water/Light Study focuses on the more reflective and contemplative side of her work. Many of her pieces exhibit a hypnotic quality characterized by repetitive motion and symmetrical patterning, such as with Bellmer Burlesque.